Military training exercises begin today in Ukraine for Fearless Guardian, and in the Philippines for the 31st iteration of Exercise Balikatan, a Pentagon spokesman said today. During a briefing with Pentagon reporters, Army Col. Steve Warren said that about 300 Sky Soldiers from the 173rd Airborne Brigade, based in Vicenza, Italy, will train members of the Ukraine National Guard at the International Peacekeeping and Security Center in Yavoriv near the Polish border. The United States has trained at the same center for years with other allies and partners, he added. “This latest training, which is as valuable in peacetime as it is in times of conflict, is to establish a professional force that protects and defends Ukraine's people [and] the country's sovereignty,” Warren said. Three hundred Sky Soldiers will train about 900 Ukrainian national guardsmen during three training rotations, each about two months long, he said. The small-unit trainers will focus on defensive and civil military operations. Specific blocks of instruction include medical training, casualty evacuation, counter-unmanned-aerial-vehicle tactics, counter-insurgency training, counter-improvised-explosive-device training, and more, Warren said. Human rights and use-of-force training also will be conducted, along with common soldier and collective tasks such as individual conduct and law of war, first aid, survival, land navigation, communication, unit operations, and counter-chemical, biological, radiological and nuclear training. The Joint Commission formed in July 2014, and Canada was an observer at the inaugural meeting in October 2014. Later, Canadian leaders requested an invitation for membership on the Joint Commission. Warren said the United States also jointly hosts two Partnership for Peace exercises each year in Ukraine, a ground forces peacekeeping exercise called Rapid Trident and a naval exercise called Sea Breeze. The training in small-unit tactics includes instruction on how to shoot, how to move, how to communicate and other individual soldier skills, Warren added, during which the National Guardsmen use Ukrainian weapons and their own munitions. “Thus far, we have provided the Ukrainians with nonlethal aid only,” he said, adding that the department delivered 30 Humvees to Kiev in March and will deliver another 300 in the coming months. Also today in the Philippines, U.S. and Philippine forces began the 31st iteration of Exercise Balikatan, Warren said. 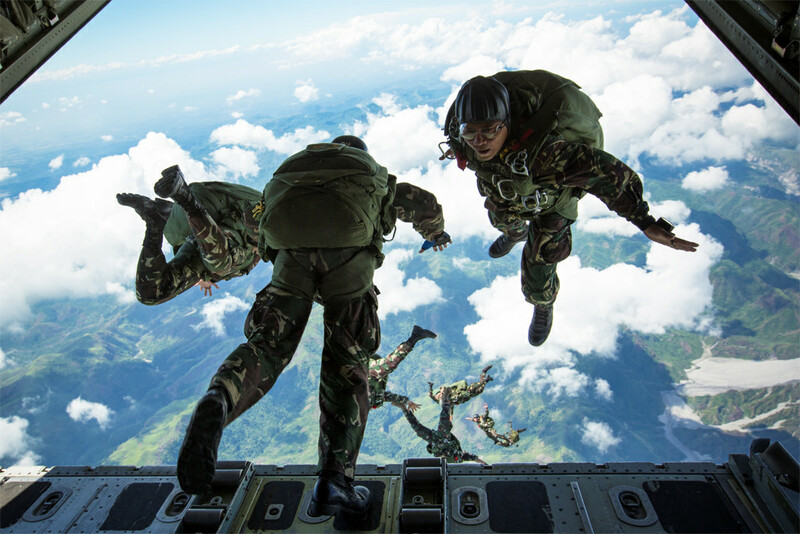 The annual bilateral training exercise and humanitarian assistance engagement seeks to improve the readiness of participating U.S. and Philippine forces. “It is a signature element of our alliance,” Warren said. Balikatan takes place in the Philippines starting today to April 30, and about 6,000 U.S. personnel will participate this year, he said, noting that 4,100 of the forces will be U.S. Marines. The exercise trains Philippine and U.S. military forces to provide relief and assistance in the event of natural disasters and other crises that endanger public health and safety. “This training proved invaluable during the relief mission [of November 2013] in the wake of super typhoon Haiyan,” Warren said. The typhoon devastated more than 35 provinces in the Philippines and displaced nearly half a million residents. Military service members from both countries also will conduct combined command-post exercises and field training and live-fire exercises, the colonel said.